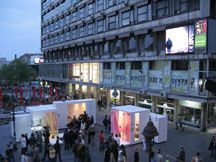 From April until the end of May 2006, the Mobile Studios will travel as a nomadic multimedia platform from Bratislava, Budapest and Belgrade to Sofia, and will temporarily possess the urban spaces in these cities. The Mobile Studios are an internationally networked pilot project of a mobile, autonomous production laboratory for young artists, musicians, performers and cultural programmers. In a subsequent program, artists and cultural producers will be invited to recreate the studio as directors. Mobile Studios are consisting of three corresponding units: the Editorial-, the Talk- and the Live Studio. The installations and urban interventions that take place in the Live Studio, as well as the conversations and discussions of the Talk Studios, will be transformed and broadcast in the Editorial Studio in various formats. The production and broadcast processes will be made visible at the same time. With its 12 square meters, the Editorial Studio is the largest exhibition module: Here, daily reports from the Talk and Live Studios will be editorially processed, archived and published in various multimedia formats. Via an XML interface, comprehensive content will be transmitted to editors and cooperative partners for further use in online editorial, web, TV and radio, press, magazines, etc. In this context, we are most interested in medial reach that can be achieved with this exhibition format. The Editorial Studio is equipped with a four-meter long work surface and four workstations with live Internet connections, scanners and streaming servers. As in the remaining Mobile Studios, the work process in Editorial will be visible from the outside through a large glass window. The Talk Studio invites participants for interviews and discussion rounds with the host city's cultural producers and audiences. A concentrated discussion atmosphere for a maximum of four participants occurs around a small round table. Two digital cameras and a directional microphone record the conversation. The Live Studio will be put at the disposal of any artist, performer or cultural producer for 24 hours. Here, the artist acts as a director and has the opportunity to design all the Studios. The Live Studio can serve as a point of reference... as a starting and meeting point for interventions involving the urban space. In contrast to the other two studios, the Live Studio is an empty white room and therefore represents the ideal backdrop for artistic performances.